3CX Phone System is an excellent way of reducing your telephony costs compared to an analogue PBX/PABX as annual maintenance and support costs are reduced due to an engineer not having to be dispatched to your premises when there is an issue. You can save additional costs by switching to 3CX Phone System as new extensions can be provisioned individually instead of a costly expansion module having to be purchased, as is the case for many of the analogue alternatives such as Mitel, Avaya and Cisco. In addition, it is easier to provision and maintain than it's analogue counterparts and it is easier to move offices as no configuration changes are required. 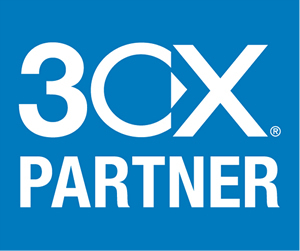 Orbtalk is proud to have a Strategic Partnership with 3CX, enabling you to continue using your 3CX Phone System when you switch to us! We have been partnered with world-leading software IP PBX provider 3CX for over four years, during which time we have helped hundreds of customers to use their award-winning Windows 3CX Phone System with our SIP Trunk solutions.